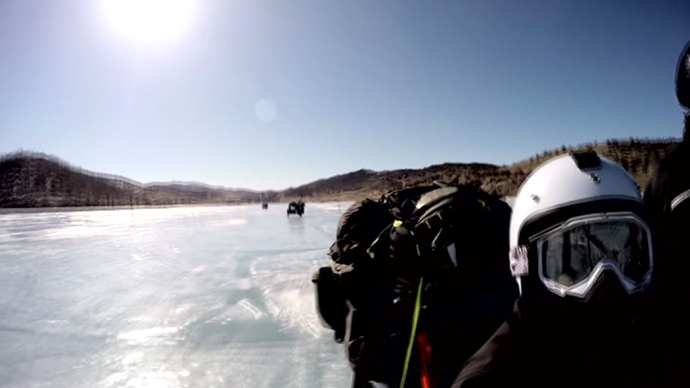 A well-known British adventurer Matt Prior joined an international team of thrill seekers for what he called an “epic” ride across the frozen waters of Lake Baikal in Russia. Prior, who cycled across the great lake, shared his amazing experiences with RT. An ex-RAF pilot and British military overseas expedition leader, Prior is renowned for his love of taking adventure trips. He spoke to RT’s Egor Piskunov about what was quite possibly the first journey of his kind as he made his way across the world’s largest lake. The team of adventurers from all over the globe, riding eight 2-seat ‘Ural’ Soviet bikes, found themselves “literally in the wilderness” in Siberia. The lake was not always easy to navigate, as one of the team members found himself knee-deep in ice-cold water while trying to stop. Other challenges included sleeping outside in sub zero temperatures and drinking melted snow. If that was not enough, the team decided to sleep in just their sleeping bags one night, to “test their equipment” and get a “fuller experience,” of being in a frozen wasteland. Doing things out of the ordinary comes naturally to Prior, who holds the World Record the highest taxi ride at 17,143 feet (5,225 meters), after driving a London cab up to Mount Everest’s base camp. Lake Baikal holds more than 20 percent of the world’s fresh water. It is 25 million years old and reaches a depth of 1,642 meters. In 1996, UNESCO declared it a World Heritage site.